For those of you who know me, yes – I have finally lost it!! No, I haven’t suddenly found a love for everything Michael Jackson, although I think that would be an easier option. I have entered the 2012 London MoonWalk!! 26.2 miles walking through London with 15,000 other insane people wearing bras and helping to raise money for Walk The Walk who support breast cancer charities. But wooohoooooo there!! I will not be attempting this on my lonesome, nope. 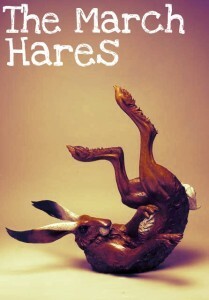 I am one half of The March Hares. The big T will be my partner in crime – I didn’t even have to force her. Not a chinese burn in sight promise. It is a well known fact that I do not excel in athletics or have ever really enjoyed any form of exercise . I am built more like an M&M than a Twiglet so this is going to be challenge to say the least. So join me on a journey of blisters, exceptionally attractive running trousers, a mild case of tourettes and the over use of Hare puns. Head up, shoulders back and put your best foot foward for we are The March Hares!